La villa era una volta la casa di famiglia, in una tranquilla zona residenziale, che è stata trasformata in due appartamenti confortevoli e spaziosi. Entrambi sono dotati di aria condizionata e di uso del giardino e della piscina. (Il bordo piscina è stata ridisegnata, una zona piacevole per mangiare, prendere il sole, ecc) L'appartamento al 1 ° piano dispone di una terrazza e barbecue privato. L'appartamento al piano terra è ideale per i bambini e disabili, senza gradini e ampi ingressi. Tutto a pochi passi dal centro storico di Mirano, che offre eccellenti negozi, bar, gelaterie e ristoranti per cibo e bevande locali. Un mercato settimanale arriva a Mirano il lunedì e merita una visita. Mirano dista 20 minuti dall'aeroporto di Venezia, 20 minuti dall'aeroporto di Treviso e 10 minuti dai collegamenti autostradali. Situato in posizione ideale per chi ama le vacanze diverse. Venezia con la sua cultura unica ha molte cose da offrire: il carnevale, redentore, bienalle il festival internazionale del cinema, St. Piazza Marchi e musei. Dall'appartamento, questa romantica città è raggiungibile in 25 minuti di autobus. Le spiagge sabbiose di Jesolo, Cavalino e Cortellazzo sono facilmente raggiungibili in auto. Vista panoramica sulle Dolomiti con i suoi sport estivi e invernali sono 1 ora di distanza. Storico di Verona, Padova, Vicenza, il Lago di Garda, e Cortina sono tutti vale la pena visitare. Ci sono molte ville di interesse della zona, per esempio, Villa Pisani dove Napoleone rimase. Bagno grande famiglia con vasca, doccia e vasca, wc, bidet e grande vasca. Lavatrice. Bagno 2. Bagno, doccia, lavabo e servizi igienici. La biancheria viene addebitata a £ 12. 00 a persona. Per gruppi superiori a 6 persone è previsto un supplemento di £ 12. 00 a persona al giorno. L'appartamento al piano terra è adatto per sedie a rotelle, anche se il bagno forse un po 'difficile in determinate circostanze. Lieu paisible au calme avec toute les commodités au tour . N'oublions pas la sympathie des propriétaires. We recently came back from our wonderful vacation in Italy and we loved our stay in Mirano. Toni was prompt replying each time when we had questions. The place is very clean and I would say it looks nicer than the pictures. We stayed in the upper unit and we loved the layout. The bedrooms are very nice separated from the living, kitchen and Bbq area. We enjoyed the pool after long days of walk. To get to Venice you need to get the bus 7E or 7DE. The Casa Lila is located at the last bus station in Mirano and it takes 45 min to get to Venice. We definetly enyoyed our stay! I also wanted to add that there were some unpredictable things that came up that needed to be fixed in the apartment and Toni responded promtly. We highly recommend his place. The property was spacious and very clean. We have just come back from a lovely week in Mirano. The apartment had plenty of room for all 7 of us, and was clean. The children loved the pool and was deep enough that after a morning run my daughter and myself could cool off and swim for 20 mins. The bikes were a great asset as we could cycle into the town to get fresh croissants for breakfast, and then in the other diection we could cycle to get the morning shopping from the supermarket. The property is in easy assess of the beach and venice . We also visited an aqua park. Mirano is a lovely market town with lots of great ice cream parlours, coffe shops and places to eat, we all really enjoyed our stay. A real home from home! We had a wonderful holiday in the spacious ground floor of this really lovely house. Everything was spick and span on our arrival with plenty of room for the 7 of us. Casa Lila is very well situated in the edge of Mirano but with easy access to the town centre - just 15 minutes or so. It is conveniently close to 2 supermarkets, the amazing butcher with his giant barbeque (which has to be seen to be believed!) and the bus station. 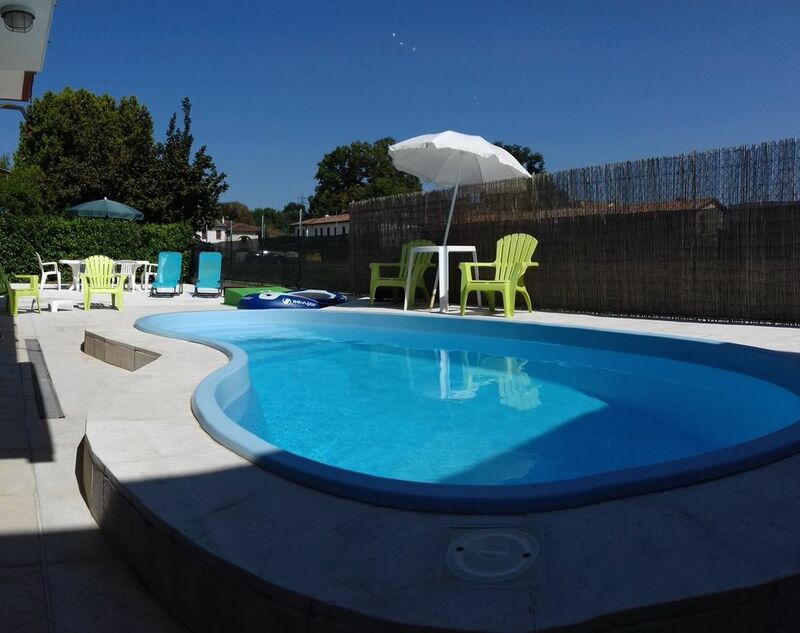 The pool was a welcome fiend at the end of the very hot weather and prepared us nicely for walks into the town most evenings for fantastic pizza and simply wonderful ice cream! All in all Casa Lila was a comfortable home from home with recent renovations adding to a great Venetian experience. I would recommend a holiday there to anyone! This is a beautifully furnished and comfortable apartment which was spotlessly clean on arrival. There was plenty of space for 3 of us but it will sleep 6 with the use of bed divans in the lounge. We were upstairs where is a spacious terrace area with barbecue facility. The kitchen is well equipped - except that the lids did not seem to match the cooking pans - with a large fridge and two shelved freezer section. It is in a quiet location on a side cul-de-sac, so no through traffic and a playing field at the rear. Mirano is a small town with all the facilities you could require. A small food supermarket is 5 minutes walk away and a larger one about half-a-mile down the main road. Motorways are within a few km and there is a regular bus service into Venice, every 20 minutes, passing at the end of the road. All in all we found it an excellent base for exploring Venice and the cities and countryside of the Veneto. Verona is just an hour away. Downstairs there is a small pool mainly suited to small children. We would highly recommend downstairs for a family with young children and upstairs for older couples or families. The owners are close by and eager to make your stay as pleasant as possible. Il Villa / Casa / Appartamenti è a Mirano è un comune vicino a Venezia. Dispone di una piscina e parcheggio auto. Una breve passeggiata per negozi e piazza del mercato con un sacco di ristoranti locali. Visita il sito di mirano (per favore contatta il proprietario per link e ulteriori informazioni). Facile accesso al Lago di Garda, Gardaland, Treviso, Castelfranco, Padova, Mestre, Le Dolomiti, Lido di Jesolo, Chiogga, Dolo, Mira, Caorle, Cortina ecc.